Recipe Process Wash properly the spinach and cut into very tiny slices. Then, cut the onion and tomatoes into small slices and cut the green chilies into slices. In a deep pan, take water (4 times of dal) and boil it. When it starts boiling add dal, turmeric powder and boil it till the dal is semi cooked. Then add spinach, tomatoes and salt as per taste to it. Cover with a lid and cook until dal tender cooked (boiled). Heat oil in a pan, add mustard seeds, cumin seeds and allow spluttering. Add onion slices and green chilies, fry till it turns golden brown. Then add the boiled dal and spinach mixture to it slowly. Lid it with a cover and boil for 5 minutes. Remove from the flame and serve hot. 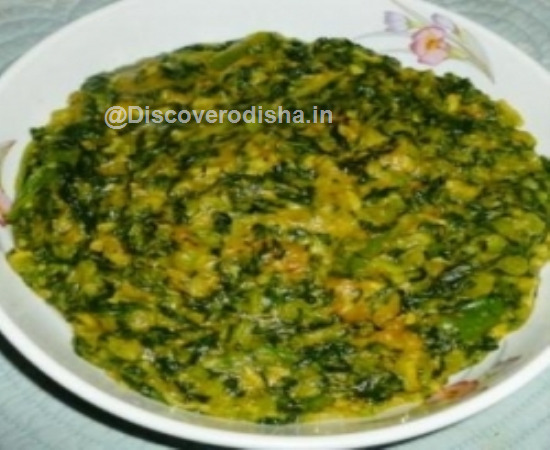 Recipe Ingredients Muga Dali ( Moong Dal ) -200gm Palaga Saga ( Spinach ) – 300gm Piaja ( Onion ) -100gm Tamato ( Tomato ) -75 gm Kahcha Lanka ( Green chili ) -2pcs Sorisa ( Mustard seed ) – 1 tsp Jeera ( Cumin ) – 1tsp Haladi Gunda ( Turmeric powder ) – 1 tsp Tela ( Refined oil ) – 2 tbsp Luna ( Salt ) – as per taste.